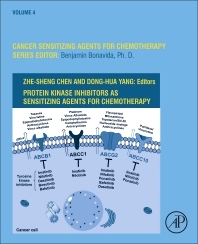 Tyrosine Kinase Inhibitors as Sensitizing Agents for Chemotherapy, the fourth volume in the Cancer Sensitizing Agents for Chemotherapy Series, focuses on strategic combination therapies that involve a variety of tyrosine kinase inhibitors working together to overcome multi-drug resistance in cancer cells. The book discusses several tyrosine kinase inhibitors that have been used as sensitizing agents, such as EGFR, BCR-ABL, ALK and BRAF. In each chapter, readers will find comprehensive knowledge on the inhibitor and its action, including its biochemical, genetic, and molecular mechanisms' emphases. This book is a valuable source for oncologists, cancer researchers and those interested in applying new sensitizing agents to their research in clinical practice and in trials. Zhe-Sheng Chen opened the St. John’s University’s first cancer pharmacology laboratory. His research interest is multidrug resistance and its reversal, novel anti-cancer drug development. Chen serves as Editor of "African Journal of Pharmacy and Pharmacology"; Editor-in-Chief of “Journal of Cancer Research Updates" and "Journal of New Developments in Chemistry". He also serves as an Editorial Board member of 25 journals, an Ad Hoc reviewer of 180 journals, and a guest editor of "Current Pharmaceutical Biotechnology", "Cancer" and "Journal of International Medical Research". Chen has over 170 papers published, 6 book chapters, and 5 patents. Dong-Hua Yang is an Assistant Professor at St. John’s University College of Pharmacy and Health Sciences. She works in the fields of Cancer Biomarkers and Cancer Pharmacology. Before joining St. John’s, she was a Research Assistant Professor at Fox Chase Cancer Center, where she took charge of the Tissue Research Service at the Biosample Repository Core Facility. She is a leading expert in the field of immunohistochemistry (IHC) and IHC quantitative analysis. She applied IHC technology to study the molecular alterations of known and novel signaling pathways that regulate embryogenesis, organ morphogenesis and tumorigenesis. Yang leads the automatic quantitative analysis (AQUA) for immunohistochemistry and immunofluorescence assays for biomarker research. Yang is the regional editor of “Current Proteomics”, guest editor of “Frontiers of Pharmacology”, “Cancers” and “Molecules”, associate editor of “ Journal of Nutritional Therapeutics”, “Journal of Cancer Research Updates” and “Journal of Analytical Oncology”, ad hoc reviewer of 0ver 50 journals. Yang has over 70 papers and 4 book chapters published.